I’m going to get two things out of the way first. The Draymond suspension and Steph’s return from injury. The Draymond Green suspension swung this series. Green is a smart, versatile player that provides the Warriors an edge they need to be great. He played a monster game 7. But a large portion of this historic meltdown rests at his feet. If he keeps his composure in game 4, the Warriors go in for the knockout blow in game 5. Instead of a reeling Cavs team, he injected new life and motivation into a group that looked ready to be put to pasture. Yes, the Warriors should have taken care of business regardless, but momentum is huge in a series and his poor decision turned the tide. Openly the Warriors are saying all the right things but I hope that there are some very serious conversations happening with Draymond about his composure. This is not the Steph Curry from the regular season. The Warriors with this Steph were a great team. But since he came back, he was missing that top gear that shifts the Dubs’ offense from very good to all-time great. It’s not an excuse, it’s just the way it is. Like the Warriors last year, the Cavs played the opponent in front of them, and they beat them. But Steph’s inability to create off the dribble took away the Warriors best and only isolation player. Klay, Draymond, Iguodola, they all need space created for them to attack. When passing doesn’t work, it’s Curry’s creativity that does it. During the regular season, when teams would take away the Warriors offensive flow, it was Curry’s ability to attack and finish at the rim that helped create seams the Warriors needed to get back into their game. The injury took away his legs and lateral movement and that hurt him subtly on defense and dramatically on offense. What a tragic way to end one of the greatest individual seasons in NBA history. On to the Cavs. What did they do to win this series? Offensively Tyronn Lue kept it very simple. While I’m not particularly impressed with his coaching (they were a suspension away from being sent home in 5 versus 6 last year), once LeBron and Kyrie started clicking he did an amazing job of picking the right rotations and understanding when to extend and rein in the various leashes on his role players. When you have LeBron and Kyrie playing 42+ minutes a game, managing the minutes of the rest of the team to ensure you have the players who are playing well on the court at the right time really game the Cavs an edge. A prime example in game 7 was the second quarter. LeBron was on the bench and usually the Warriors make a run during those minutes. Love had been struggling all series but Lue trusted him and Love responded by hitting the glass and getting to the line and playing a tough Warriors line up to a draw. In some games he’d trust Iman Shumpert. In game 6, he put in Dahntay Jones. The guts to make the lineup calls he thought was necessary was important. There is a lot to be said about his job realizing that you’ve got the best player in the world, just make sure the rest of the guys don’t screw up. Defensively, LeBron turned the Warriors into a three-point shooting team. The Warriors shot less than 50% from the paint during the series – the only time during the year this happened. This can be credited to the stellar rim protection provided by LeBron James. In particular, he erased a bunch of Warriors transition opportunities in games 5-7 by using his athleticism to put himself back in plays a normal human being had no business even contesting. Speaking of the defense, this is where Lue probably did his best work. Simply put, the plan was to smother Steph and Klay while putting LeBron on Draymond to neuter the high pick and roll that caused Cleveland fits last year. This left lots of Warriors open for looks from three point line but it was very rarely Steph or Klay. In the first two games, the supporting cast punished the Cavs. But as the series continued, the shots that were falling initially abandoned the Warriors. And with no Warrior able to break down the D in isos to get to the rim, they were dependent on maintaining their shooting to win the series. But if they missed, the Cavs were going to run it down their throats off long rebounds. It was a calculated risk that panned out very well. Despite the Warriors’ reputation for depth, it was the Cavs’ role players that showed up to play. In particular, Thompson gave the Warriors fits on the boards and offensively showed some creative brilliance while finishing in the paint. As the series dragged on, his free throw shooting improved and he punished the Warriors for fouling him again and again. In the second quarter of game 7 when LeBron hit the bench, the Warriors looked prime for a run. However, Kevin Love was having none of that and pounded them down low, getting to the line for key free throws. Surviving Lebron-less minutes is huge for the Cavs and Love, although not a role player, really made a difference at a crucial point in the game. And who would have expected that he would stifle Curry so effectively (if THAT’s not indicative of a not-quite-right-Steph, I’m not sure what is) on the Dubs last real look. Finally, JR Smith shook off a rough start to the series and in the third quarter of game 7, hit three well-contested shots against a Warriors defense that had looked very strong in the first half. The Warriors needed their depth considering how talented the top of the Cavs’ roster is but it was the Cavs that found contributions from further down their lineup. Kyrie Irving was out of his mind in games 5 and 7. At times, the Cavs offense turned into, put the ball in Kyrie’s hands and have him make something happen. Whether it was in the half court or transition, he took and made some very tough shots. Most guys don’t have the talent to finish those type of looks but Kyrie proved his mettle in these last three games. He also committed to consistent effort on defense which allowed him to play 40+ minutes a game. If he’s a liability, the Cavs don’t win. And of course there’s the clutch 3… goddamn that clutch 3. The Cavs won because they grabbed the series. After the brutal Western Conference Finals and running out to a 3-1 lead, the Warriors fell victim to their own success. In games 5 and 6, they expected their shots to fall because they were “supposed” to win. They had won 73 games. They had come back from 3-1. It was impossible to them that they could lose. The Warriors failed because when it came down for them to walk that fine line between confidence and hubris, the slipped up. The Cavs knew they were playing a great team, but they had the two best players in the series and stuck to their plan. As the Warriors composure unraveled, the Cavaliers played calm and weathered all the runs the Dubs had in them. They kept the Warriors out of rhythm with wonky changes of pace and immediate timeouts when it looked like there might be a run. The Cavs punished the Dubs for their overconfidence. Watching this series was an interesting match-up of two very different styles. The Warriors, being based on the Spurs, are very much a “trust the process” type of team. Their goal is to run their offense and find the best shot – regardless of who the player is on the floor. When they are locked in on defense, their goal is to give up the worst shots. Something late in the shot clock and heavily contested. They have lapses in discipline now and again but they’ve beaten teams because with their talent, athleticism, and shooting, the process ends up tipping the scale in their favor over 48 minutes. It helps that Klay and Steph are two of the best shooters of all time. The Cavs on the other hand were much more direct with their offense. You have two talented players, don’t overcomplicate things. Everyone knew that LeBron or Kyrie was getting the ball. Put it in their hands and let them create. The Cavs shot 55% in iso situations over the last three games – that’s some killer efficiency. And it’s what the Warriors want teams to do. However, time and time again they hit the shots the Warriors wanted them to take. It was brutal. The Cavs dictated the pace through their selected transition and grind it out isolation possessions. The Warriors never found their flow. And that’s a wrap on the NBA season. This finals sets the league up for a nice rivalry between the Cavs and Warriors in the years to come. Sign me up for the rubber match. It’d be nice if the Dubs lived in the East so they could avoid the gauntlet of the West but both teams have the talent and youth to make it back and recreate some of the magic Boston and LA brought to the NBA in the eighties. I may have one more Warriors-centric post left in me but outside of that, it’s been a wonderful ride in these Playoffs and I’ll certainly miss the NBA until October. 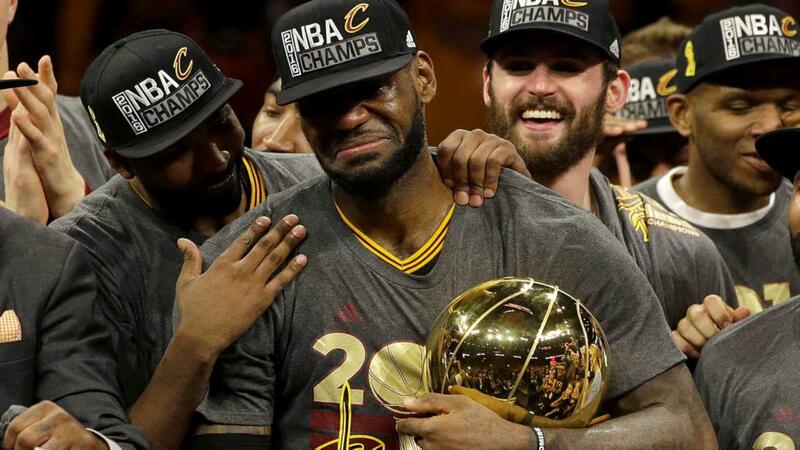 Congratulations to LeBron and the rest of the Cavs on an amazing run.